Sony’s next generation Xperia Tablet Z was expected for quite some time now, especially after the Japanese tech giant unveiled the Xperia Z smartphone at the recently concluded International Consumer Electronic Show. Xperia Tablet Z brings with it the same dark and sleek form factor of its smartphone cousin, but with a 10.1 inch sized display. Before we go ahead to speak about the specifications there is one major fact about Sony’s new tablet that must be mentioned first. Sony has abandoned the folding design of the Xperia Tablet S and has thus managed to build the thinnest tablet in existence today. Measuring in at a mere 6.9 mm, the Xperia Tablet Z beats even the Apple iPad mini, which measures 7.2 mm. The Xperia Tablet Z also weighs just 495g. Furthermore, Sony says in its announcement that the new tablet is actually waterproof and dustproof. Yes, that’s right. Not “resistant” but “proof”, though it has not been mentioned to what extent. Pretty amazing indeed. The tablet runs Android 4.1 and is powered by a Qualcomm 1.5GHz quad-core APQ8064 processor accompanied by 2GB of RAM and 32GB storage. Another highlight of the tablet is its 8.1 MP camera. Sony has used its camera technology expertise here and for the first time, the tablet features a back illuminated sensor. The camera has a low-light mode, which recognizes poor lighting conditions and backlight and automatically adjusts itself for optimum setting. 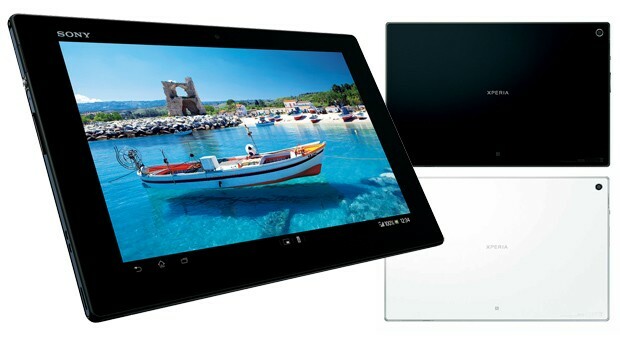 Xperia Tablet Z also features Sony’s “S-Force (Force es) Front Surround 3D”, which provides a virtual surround sound experience. And of course, the tablet also comes with LTE and NFC. No official word on the battery yet. Xperia Tablet X will be available in Black and White models in Japan, starting from the second quarter of the year. No word on the pricing or global availability yet.